Earlier this year THP was able to get the Arccos 360 in hand for review on the Android platform. As noted in that review, while there is plentiful potential within the device and software, there were some complications seen throughout use where consistent tracking was concerned. Arccos actually reached out about this and has acknowledged that they are still fine tuning their Android capabilities because the initial build and development was in conjunction with iOS devices. Because of this, the decision was made to revisit the Arccos 360 but this time on an iOS device to see if there is in fact a notable performance difference. As was discussed in the Android version of the review, the setup of the Arccos 360 out of the box is impressively intuitive, it actually isn’t a stretch to say Arccos is head and shoulders above their competitors here. Installation is a cinch, as after screwing the sensors into your clubs from driver to putter and installing the app on the iOS device you just follow the directions as you are walked through scanning each sensor to identify to the system what club each is attached to. From here, the user selects the course or courses they are going to play and is able to download it ahead of time just as with the Android version to speed up the process. From here, you simply boot up the app when you are ready to play, pick new round, pick the course, put it in the proper pocket, and go play. To get to the point, the difference we saw from the Android and iOS versions was nothing short of staggering where consistency and accuracy were concerned. From the onset, the tracking was exponentially better, in fact, the first 5 holes played had no dropped shots. While dropped shots did still occur from time to time, that really should still be expected because the technology and relying on accelerometers in your pocket are bound to have at least some minor issues. Overall, this was the experience that most will hope for from something with the price point of the Arccos 360 setup. Because the tracking showed better performance, this too allowed for the actual app to sort of flex its muscles more than in the Android review. The amount of data that the system is capable of tracking is plentiful and the nice thing is that the user can decide themselves just how in depth they want to analyze their games. The different metrics that are available to be broken down are a lot of fun when the system works as Arccos designed it to do, in fact, time with the iOS version simply reinforced that it could be quite a useful tool when recorded data is shown to an instructor so they get a better feel, not just for their students strengths and weaknesses in distance, but how they actually negotiate golf courses. Necessary to mention still, is that the battery drain with a system like the Arccos 360 is simply going to be a part of life for the users. While it has improved from the original Arccos system, the battery usage is still on the higher end, and the user will want to ensure they have adequately charged their device before entering the round, or that they have an alternative battery source to utilize (but keep in mind, it must be in the front pocket with the phone if that is the case). Overall, the performance seen with the iOS device was what was expected entering the Android version of the review. With that said, the age of the device for Android still could play a role for the accuracy of the accelerometer in the device is critical for the 360 system to work at its fullest potential. While hearing Arccos themselves acknowledge the issues with Android compared to the iOS version will be a downer for many potential users, the shining light in it all is that if/when the company gets things fine-tuned to be on par with the iOS build then the performance and statistic capabilities could honestly ‘wow’. 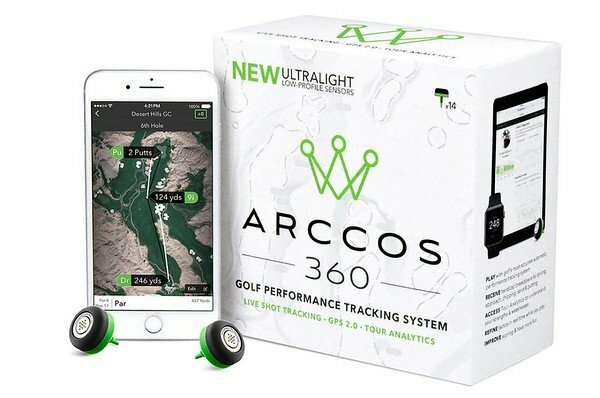 It is going to be interesting to see how Arccos continues to evolve their 360 tracking system, though if their joining forces with Cobra is any indication, the potential is most certainly there. Would you say wait on the Android version then? Do you think it’ll actually come up to speed where it’s worth purchasing? I picked up a set after I saw your update on the forum that it works much better with iOS. I have only used for 9 holes so far, but already am enjoying the features, and the only shots I have had to update were tap-ins, and extra shots out of the sand. All normal shots have tracked correctly. Good write up James. It’s great to have tech like this to show us the truth of our games, and the ability to take it back to an instructor is a huge benefit for some folks I’m sure. Good review James. I think for most iOS users, this could be the ideal tracking device. Unfortunately I’m on my phone a lot during my rounds, plus I’m an Android owner. I hope Arccos produces an alternative that is less reliant on the phone. Great review James as a user of the original iOS and one that loves data and analytics to help me improve – I was disheartened by the issues with Android – however the new tech in the 360 using the accelerometer also it being 7 grams vs 11 grams has me itching to swap mine out for the newer version. was really interested in the this product but seems to be so many technical issues still to be worked out. going to hold off and use my Bushnell gps for now and hope to adopt this product of something similar in a couple years when they are hopefully more evolved. I fully agree with the above. I own an Android phone and also am issued an iPhone through work. I installed it on my Android because on the weekends when I am at the course my work phone is sitting at home. My first use of the Arccos 360 with my Android was not a pleasant experience. It was missing almost one shot a hole and it sucked the life out of my battery. I actually had to turn my phone off on the 16th hole to save my last bit of power for any emergency. So I downloaded the app on my work phone and wow what a difference. No missed shots at all. Plus they now have the “Caddie” option for IOS app which looks pretty cool. Looks like my work phone needs to come with me on the weekends now, but at least my personal phone can sit in the cart not using any battery at all. My iPhone ended the round maybe only using 40-50% of battery life. Granted my personal phone is running with much more apps than my work phone. If you are an Android user I definitely recommended holding out to see if the app is improved. Or try one of the other shot tracking systems instead.